Deze tekst is ook beschikbaar in het Nederlands. In the area around Turnhout, traces have been found of Neanderthal hunters dating from 35,000 BC. The oldest remnants found in what is now the city centre are from the Neolithic Age (4500-2500 BC). The emerging pattern of roads circumscribed the many swampy areas in the Kempen region, following the higher ground of ridgelines. One of these carriage roads ran from Antwerp, via Beerse, and passed through the site of the present-day market square, where it diverged towards Oud-Turnhout to the East. Recent archaeological work has uncovered multiple sites from Roman and Merovingian times. Probably in the period shortly before 1212, the Counts of Leuven obtained lordship over the area around the present-day market square in Turnhout. The granting of libertas and city privileges to Turnhout and other towns in the Campine region by Henry I was one of the key elements in the development of the Duchy of Brabant. Residents who elected to live within the free city were exempted from taxation by the lord. In 1338 the city obtained the right to hold an annual fair so that all of the goods from the surrounding villages could be offered for sale in Turnhout. The beguinage, which is recognised on the UNESCO-world heritage list, had been established by in 1340. The second half of the fourteenth century, by which time two annual fairs were held in Turnhout, saw the development of a major industry in woollen cloth in Turnhout. The Castle of Turnhout was significantly expanded by Maria of Brabant, daughter of Duke Jan III. She commissioned the construction of a Market Hall to the south of the market square. She also established the Priory of Corsendonk and a chapter of 12 canons at the Sint-Pieters Church. The subsequent Dukes of Brabant enjoyed coming to Turnhout to go (falcon) hunting. Turnhout was sometimes referred to as ‘little Brussels’. In the 16th century, more than half of the 7000 inhabitants of Turnhout were employed in the textile sector, specifically in the manufacture of ticking (a linen fabric used for pillow covers and the like). In 1545, Charles V made a gift of the territory of the ‘Land van Turnhout’ to his sister, Maria of Hungary. She transformed the castle into a sumptuous residence. Turnout too fell victim to the iconoclastic attacks in 1566. In 1597 the battle of Tielenheide took place. The cavalry, led by Prince Maurice of Orange thoroughly routed the Spanish army of the Count of Varax. In the 17th century, based on its population, Turnhout became the largest city in the Antwerp Campine region, ahead of Herentals. In 1667, commissioned by Amalia Van Solms, an engraving was produced by Lucas Vorsterman II which shows that most of the buildings surrounding the market square were in Brick Gothic style. The 27th of October 1789 would go down in national history as the ‘Battle of Turnhout’. The reform policy of Jozef II was not well received in the Austrian Netherlands. Brabant insurgents drove back the Austrian army in the mist covered city. During the French occupation, the old institutions, guilds and artisan organisations (ambachten) were banned. The Sint-Pieters Church was used as a stable for horses. 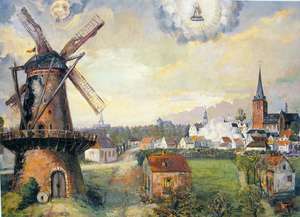 In 1798 a group of peasant irregulars revolted in Turnhout. One of their leaders was the Leuven-born book printer Pieter Corbeels. During the reign of Napoleon the old plans to build a paved road from Antwerp were realised. A decade after Belgian independence, the canal was extended to Turnhout followed by the railway link in 1855. In 1886 the tram line to Antwerp was officially opened. During the Industrial Revolution, textile production suffered a severe decline. The paper processing industry became the source of innovation. The major factories were initially those of the companies Brepols and Glenisson & Van Genechten. Turnhout became Belgium’s leading manufacturer of playing cards, books and coloured paper. Lace making was the chief professional activity for women. The harsh labour and living conditions for the working class were gradually improved as the result of strikes and actions of the labour movement. In 1904 Turnhout was the second-largest city in the province with a modern water supply and sewer network. After the Second World War, most factories moved to the periphery of the city. The electro-technical, pharmaceutical (Dr. Paul Janssen) and chemical industries experienced dramatic growth. Playing cards manufacturer CartaMundi even became the world leader in the sector. Turnhout soon came to play a central role in the area of education as well. The advent of modern hospitals, sports and youth centres and museums, not to mention the Cultural Centre De Warande contributed to the city’s unofficial status of ‘Capital of the Campine region’. Officially, Turnhout is the capital of the eponymous electoral district and legal canton. The cityscape changed profoundly with the demolition of numerous buildings such as the old City Hall, and the construction of new, modern structures. The Ringlaan and the E3-motorway (the current E34) were designed to accommodate the ever-increasing automobile traffic. Turnhout was spared from the wave of town mergers in 1977. Ultimately, the collaboration with Oud-Turnhout, Vosselaar and Beerse came about through the creation of the Turnhout Urban Region in 2007, which became one of the 13 metropolitan centres in Flanders. Turnhout now stands resolutely in the 21st century. An ambitious Turnova development project at the Brepols site, the renovation of the station area (Niefhout ), the new library and issues related to mobility demonstrate that there are still plenty of challenges for the future.